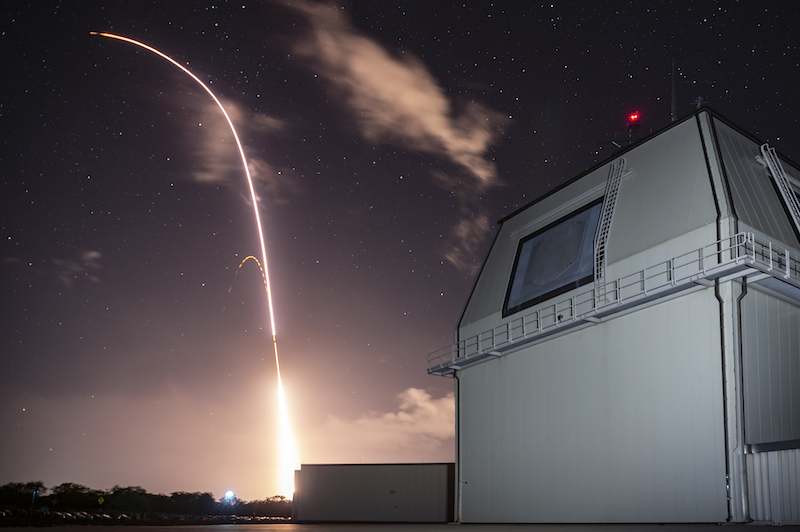 KAUAI, Hawaii --- The latest evolution of the Aegis Combat System, Baseline 9.B2.0 (BMD 5.1), further advanced engage on remote technologies following a successful U.S. Navy- and Missile Defense Agency-led on-land ballistic missile defense system test event. During the test, the Lockheed Martin-built Aegis Weapon System engaged and intercepted an Intermediate Range Ballistic Missile (IRBM) target with an interceptor missile based on ground-based radar track and discrimination data provided by Command and Control, Battle Management and Communications (C2BMC). Aegis Baseline 9.B2.0 seamlessly demonstrated an operational test engagement of an Intermediate Range Ballistic Missile (IRBM) using EPAA Phase 3 architecture during an event that took place with Aegis Ashore at PMRF with track data being provided by C2BMC based on MDA sensors. PACIFIC MISSILE RANGE FACILITY, Hawaii --- The Missile Defense Agency completed the third successful intercept of a ballistic missile target by a Raytheon Company SM-3 Block IIA missile, the next-gen variant that defeats missile threats outside the earth's atmosphere. -- The first successful intercept from a land-based launch. -- The first intercept of an intermediate-range ballistic missile target. -- The first intercept using tracking data from remote sensors, known as "engage on remote." Raytheon Company with 2017 sales of $25 billion and 64,000 employees, is a technology and innovation leader specializing in defense, civil government and cybersecurity solutions. Raytheon is headquartered in Waltham, Massachusetts.